The Gibson SG is one of the guitar worlds greatest instruments, and the great looking Gibson SG Junior is the entry level model of this iconic guitar. Furthermore, in my humble opinion, the rubbed vintage burst, low gloss finish version is one hell of a great looking guitar that plays as good as it looks. Introduced in 1961 it is claimed by Gibson that the SG is their best selling model of all time. That is to say that the SG has even surpassed the Gibson Les Paul for popularity! So there must be something right that makes it the instrument of choice for so many guitarists. Featuring a solid body with the distinctive SG double cut-away horns and two humbucker pick-ups the SG is not going all out to impress with fancy frills but there is something about this guitar that just keeps us coming back for more. Lets look at the Gibson SG Junior in more detail. Gibson, celebrating 2013 as “the year of Les Paul” have released a range of stripped down versiosn of their classic guitars. 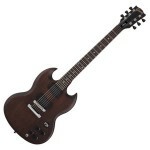 We have previously reviewed the Gibson LPJ 2013 so now it is the turn of the Gibson SG Junior. The idea is that the new range of guitars will suit entry level budgets which we think is a great idea for those of us who have always hankered after owning a piece of Gibson but just could not afford the price tag. The Gibson SG Junior features the distinctive SG body cut from solid mahogany giving this guitar a great solid feel and fantastic resonance. The neck is mahogany, glued into the body, which has been hand carved to the Gibson comfortably fast rounded 50s neck profile. The fretboard is rosewood and has 24 medium jumbo frets with pearloid dot inlay fret markers. In terms of electrics the Gibson SG Junior features the standard two humbucker pick-ups. The neck pick-up is a 490R and the bridge is the 490T, both with Alnico II magnets which are said to give better tonal quality at higher volume. Pick-up selection is by a 3 way selector switch and there are individual volume and tone controls for each of the pick-ups. In keeping with the minimalist feel of this guitar the bridge is a Tune-o-matic with a stopbar tailpiece. Plugged in the Gibson SG Junior is a great instrument to play. The rounded 50s neck is comfortable, fast and the full two octave fretboard is easily accessible due to the deep double cut-aways. The Gibson SG Junior is a great sounding instrument both clean and distorted. The pick-ups respond evenly to whatever is thrown at them and the tonal output of the guitar is fully realised due to the individual tone controls for each pick-up. I am not sure that 2013 should just be the year that Gibson celebrate everything Les Paul. The build quality and price point of this great guitar suggests that it should also be the year that they celebrate everything SG. Give the Gibson SG Junior a go, you won’t be disappointed.